In Cancun, you only need one day to taste Mexican food, get some beach time, and dive into the city’s buzzy nightlife. Get the most out of a quick trip by staying close to the heart of the action, skipping longer tours and time on the road in favor of immersing yourself in all Cancun has to offer. Here’s how to experience Cancun’s best in one day. After a Caribbean sunrise, go beyond the Hotel Zone to discover some of Cancun’s culture. A guided markets and street food tour is a great introduction to a side of the city that differs from what you’ll find on a resort beach. Bring an appetite for something new, as most food tours feature a series of included tastings. With your tour guide, you’ll discover Yucatan specialties that are completely distinct from the rest of Mexico’s cuisine and get the backstory on every dish you try. There are endless ways to enjoy Cancun’s spectacular coral reefs and beaches, with options ranging from leisurely to adrenaline pumping. A horseback riding tour by the ocean combines jungle trails and time on the sand, while renting a speedboat means spectacular views of postcard-ready beaches and resorts. Some of Cancun’s most beautiful scenery, though, is beneath the waves—check out the Great Maya Reef on a snorkeling tour, search for massive whale sharks in their seasonal breeding grounds, or opt for a submarine tour that lets you get up-close views of the reefs without getting your hair wet. Cancun has legendary nightlife, but that doesn’t mean that evenings are only for those who like to party. To catch the beaches at their best, go for a walk along the shore or take a sunset flight that offers aerial views of coral reefs through crystal-clear water. Family-friendly evening options include dinner cruises on the sheltered Nichupté Lagoon and Riviera Maya Cirque du Soleil shows. And if you do want to spend your night taking in Cancun’s party scene, nightclub tours get you into a series of the hottest local spots, with many tours including cover charges, drinks, and transport. It’s a recipe for a wild, worry-free night. Experience tablecloth dining along with the Cirque du Soleil® show 'JOYÁ' at the Vidanta Riviera Maya resort. Allow yourself to be mesmerized by the story of an alchemist and his granddaughter seeking out the secrets of life. The show draws on the heritage and history of Mexico to weave the story, presented in an intimate dinner theatre in the jungle of the Riviera Maya. Round-trip transportation from Cancun is included. Pack in the water adventures on this 2.5-hour tour in the Cancun jungle. Get your adrenaline pumping with a speedboat ride around Nichupte Lagoon, and slow the pace down with peaceful snorkeling along the Punta Nizuc coral reef. Colorful marine life and sparkling blue waters await you. A guide is present throughout to make sure you enjoy your outing. Tour all of Cancun's nightlife highlights during this night on the town at Coco Bongo Cancun and Carlos and Charlies Cancun. Dine on a Mexican feast with unlimited open bar at Carlos 'n Charlie's, where waiters dance and sing while serving your food. Marvel at acrobats and a light show accompanied by live music at Coco Bongo nightclub. Cancun, Mexico's biggest party gives you access to an open bar along with cover bands playing hits by J Lo, the Village People, and the Beatles during this 5-hour outing. Cruise on Nichupte Lagoon while dining on lobster and steak during this evening boat excursion from Cancun, Mexico. Tune in to the mysterious sounds of wildlife while floating through the jungle on this dinner cruise, a marked change from the crowds of the city. Watch the sunset over the lagoon while you enjoy the food and company on this 2.5-hour boat trip. When dinner is over, join the party on the deck for dancing and unlimited drinks. Dance and party the night away at the best nightclubs in Cancun, Mexico. Party-hop to 3 of the top clubs in Cancun on this 6-hour evening that includes VIP service and unlimited drinks. Skip standing in long lines with VIP entry. Cancun's nightlife scene is yours to explore on this VIP nightclub experience. See white sand beaches, reefs, and thick jungle from the air with a 20-minute sunset flight from Cancun towards Isla Mujeres and Punta Sam. 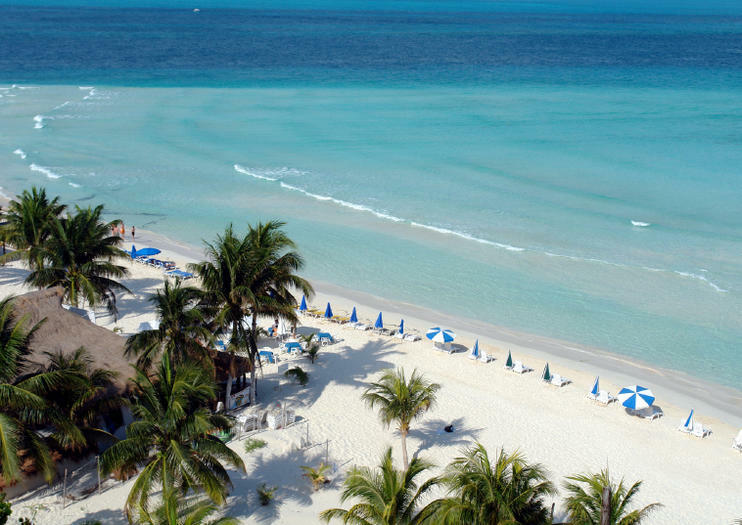 Enjoy sweeping aerial views of the Caribbean Sea on a sightseeing tour that includes door-to-door transport from centrally-located Cancun hotels. Explore Cancun's waters on this submarine-style glass bottom boat ride. Cruise through a mangrove swamp during this 2- to 3-hour excursion to Punta Nizuc, the second-largest coral reef in the world. On this family-friendly adventure, learn about the local fish, coral and other animals in this marine habitat through your guide's informative commentary. Opt to snorkel on the reef with provided equipment. Channel your inner vaquero or Mexican Cowboy on a horseback riding tour near Cancun. Traverse Mayan jungle and enjoy spectacular ocean views as this excursion takes you beyond the city. Your experienced guide will fill you in on the Yucatan's flora and fauna as you go—making it an ideal excursion for nature and wildlife lovers—and all skill-levels are welcome. For a truly authentic experience, don your own cowboy hat and pair of boots. The horses, of course, are provided. Enjoy the Captain Hook dinner cruise from Cancun aboard an 18th-century reproduction of a Spanish galleon ship. Watch entertaining pirate antics, play swashbuckling games and engage in a ship-to-ship battle. Dine on steak, lobster or chicken and enjoy an open bar during this evening adventure with views of Nichupte Lagoon and the Mexican coastline. Get to know the street foods and local markets of Cancun’s Market 23 on this morning 2 to 2.5-hour walking tour led by a professional chef. Savor tastings of freshly made tortillas, Mexican cheeses, Caribbean fruits and more. After the tour, enjoy free time to purchase the snacks and ingredients that hit the sweet spot for you. Add convenience with an upgrade to include round-trip hotel transport. Steer a speedboat through lagoons and mangrove channels on a self-drive adventure from Cancún, and explore the vibrant coral reefs of a National Marine Park. Follow a guide boat along the coast, and watch for the birds and wildlife that thrive within the sheltered mangrove forest. Skim across the waves towards the scenic Nizuc Point then slip into the water for a guided snorkeling tour of a protected coral reef; spot brilliant coral and fishes, and soak up the Caribbean sunshine before starting your engine for the return trip. Soar high above the Caribbean Sea on a Flyboard; a personal water jetpack. During this 20-30 minute activity, try one of the newest watersports, invented in 2011. The water hose connected to the board will propel you up and across the surface of the water. Receive instruction from an experienced guide before zooming across the surface of the water 30 feet (10 meters) in the air.